We left Gundlupet after having the breakfast provided by the JSS Mutt. The entire team was charged up and spent nearly 2 hours in Gundlupet walking to every shop and person that they saw. 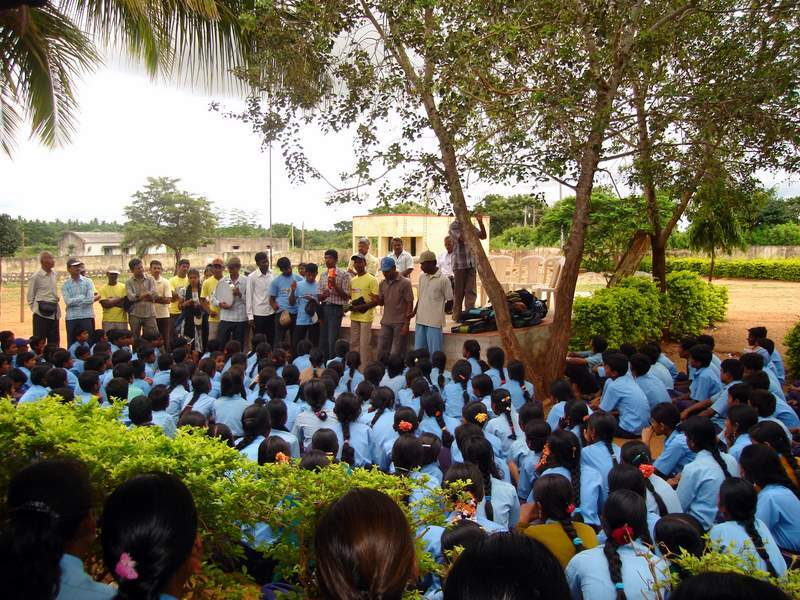 They spoke to each one of them regarding RTI and sold books too. One had to watch them in action to understand and appreciate their drive and energy levels. 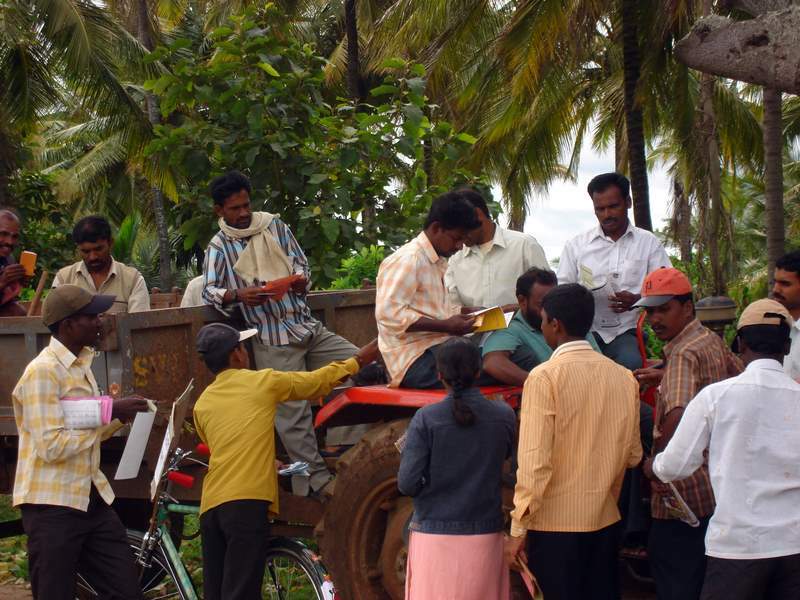 Along the way tractors, bullock carts and motorcycles were stopped and people given a talk on RTI and fighting corruption. We then reached Chikkathippur and one team went into the village to talk to the villagers individually. Today the strategy that has emerged is to target groups of people and families directly. I and a few others spent time in the local school and spoke to the children. We observed that the girls were more interested in what was happening and bought more RTI books. 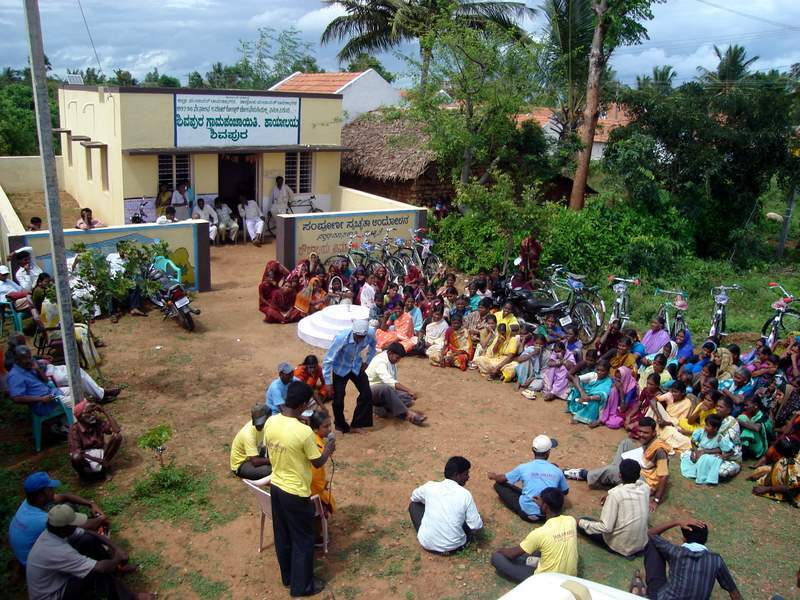 At Terakanambi, we went to the Gram Panchayath and requested to see the NREGA registers and the RTI boards. I also took time to visit the local PHC and interact with the doctor. Here, for the first time after the walk began, the local community bought us lunch rather than preparing it themselves. The walk seemed the longest today and it was indeed so (we walked 22 km). Before reaching Chamarajnagar town, we performed a street play in front of the Gram Panchayath office of Shivapura village. 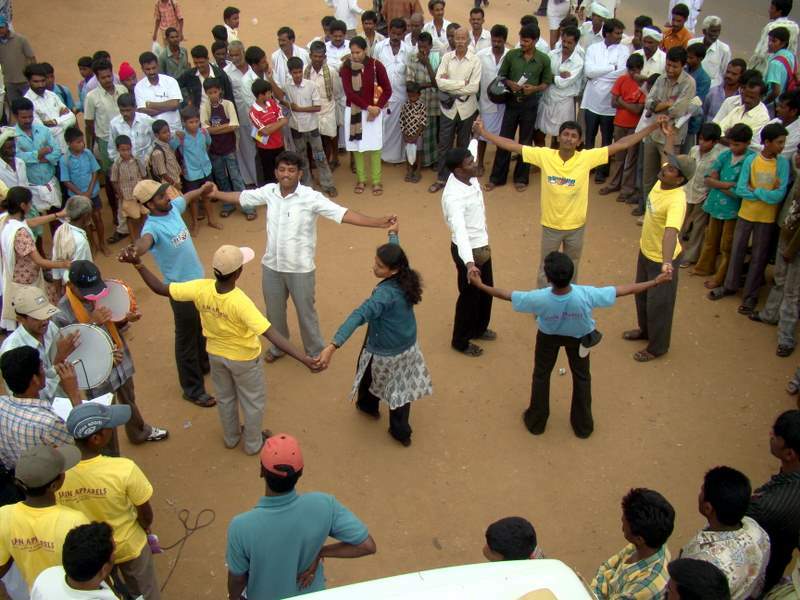 Nearly 100 members witnessed the street play. Here we had a first hand experience of corruption in the PDS system. A PDS mobile van was selling rations and one got to see how things work or does not work. Corruption is indeed eating into the vitals of this nation. The tragedy is that the people have taken this for granted and have stopped reacting to such adverse events. For them, this is now a way of life and not being corrupt is an aberration. There is now so much to be done, so much to be changed, but there is so little time. In the heart of Chamarajnagar town, we formed a human chain protesting against corruption in public life. Hundreds of locals joined us and we walked together along the main street of the town. …During today’s debriefing session, each member spoke about his/her experiences of the past one week and expressed how different and life-changing this Yathre has been for them. … I am now convinced that values can be taught only by living them. Each member of the team comes from such diverse backgrounds and environments. Each one is waiting to be shown a higher path. As one interacts with these young people, one can easily understand and appreciate how the future is safe in the hands of enlightened youth driven by values. I am now leaning more and more towards building such young people. We have had enough of Institution-building. With the credibility of what we have done the last few years, we now need to accelerate the task of ‘people building’.